When the Wii first launched in 2006, there was one game that stood above all the rest – Wii Sports. The game made great use of the Wii’s most unique feature, hand tracked controllers, and packaged it in an accessible format that even your grandmother could pick it up and play – and she may have. That turned out to be a winning formula for the game, which has sold over 82.69 million copies since its release – enough to make it the second best selling game of all time. VR Sports Challenge won’t be as simple as Wii Sports, but it also isn’t going to be nearly as complex as other sports simulators like Madden or NBA 2K. “We took all the fun parts of a sports game and digested it down into a sports experience,” says Tip Guerrero, Sanzaru’s creative director. In the football game, for example, it is boiled down to some of the most simple aspects of the game. You get the chance to simultaneously play the QB and the receiver, picking plays and tossing the ball then trying to catch it at the other end. You will receive points for “how well you catch the ball,” as well as for the result of the play itself. By simplifying the game some of the core basics, Sanzaru makes the game accessible to a wide range of people, which is important especially given that VR will likely be an initially niched market to begin with. “We want to make it accessible to people who might not know how to play football,” says Guerrero. Sanzaru has had some experience with hand tracked controllers before. Previously, the company developed Ninja Reflex a party game for the Wii that challenged your reflexes to pluck flies out of the air, parry samurai sword blows, and toss ninja stars. That experience has taught the team a lot about how to utilize hand tracked input effectively, including when to be precise and when not to be. 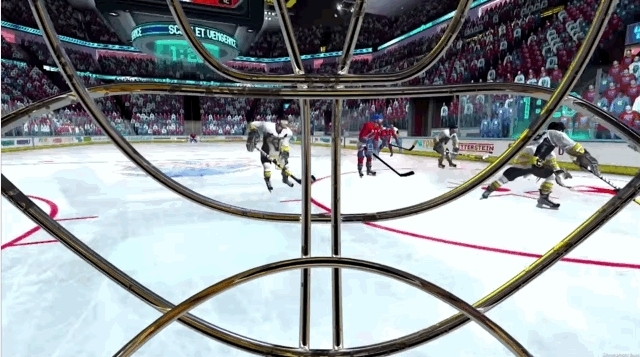 The game won’t only be compatible with the Touch controllers, as Oculus has been demoing a gamepad version of the hockey game since E3, however one can imagine that the hand tracked experience is much more fulfilling. VR Sports Challenge is looking to launch with the Oculus Rift in Q1 2016, with Touch support coming later in the year with their release.